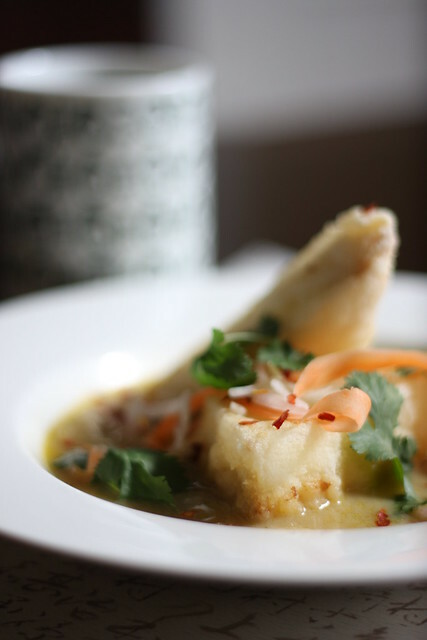 This soup has everything—spicy hits of ginger and crushed red pepper, citrusy notes of galangal and lime, clean and crisp carrots and cilantro, and rich coconut milk with deep-fried tofu. 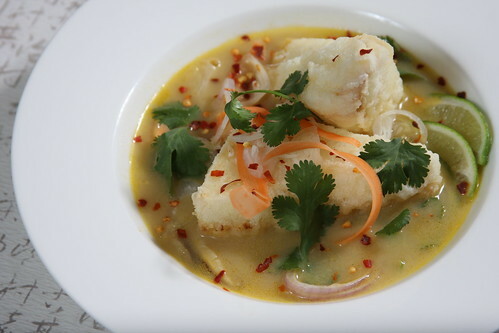 While not a true Tom Kha Gai, this soup is inspired by and similar to the popular Thai dish. Since I make thai food often, I prepare my own vegan fish sauce, and freeze the whole batch in ice cube trays for perfect tablespoon-sized portions to add to soups and satay sauces. So while I’ve included the vegan fish sauce in the ingredient list here, it’s not necessary to do all that work for this particular dish—even if you don’t include it, it will still taste good. Whisk the coconut milk and broth in a medium stockpot over medium heat. Add the lemongrass, galangal, ginger, garlic, half of the cilantro, soy sauce, vegan fish sauce, kaffir lime leaves and shallots. Simmer for 20 minutes and then remove half of these components from the broth with a skimmer and discard. If you are going to include the glass noodles, boil some water in a small saucepan, place the noodles in the water, turn off the heat and let sit until you are ready to serve the soup. To prepare the tofu, set up two wide shallow bowls—one with cornstarch and one with the Ener-G mixture. Heat plenty of vegetable oil in a wide frying pan over medium high heat, about 7 minutes. You can tell when the oil is ready by inserting a wooden spoon into the oil. If it bubbles up around the spoon, its ready. Working in batches, dunk the tofu triangles into the Ener-G mixture, then transfer to the cornstarch, tapping off any excess. Add to the hot oil and fry on each side until golden brown. Remove with a slotted spoon and place onto paper towels to drain. Return to the soup, adding the carrots and shiitake mushrooms. Let simmer for 5 minutes more. Add all of the components into a bowl, topping with the fried tofu triangles, some of the fresh cilantro, crushed red pepper and lime slices. That sounds so good. I'm putting this on the list for the next couple of weeks. Gah! That looks so darn amazing! mmm, looks delicious! I've wondered how to make Tom Kha Gai, and it doesn't look too very difficult… thanks so much for posting! Congratulations! We wanted to inform you that this post has been selected as a Featured Archive Post on our site for the first two weeks of January 2013.